American luxury jeweler Tiffany & Co. has recently opened a new boutique in London at Selfridges department store on Oxford Street. Tiffany’s new boutique covers a space of 220-square-meter and features a Private Selling Room and a dedicated Bridal Salon where customers can sip champagne while browsing Tiffany jewelry designs. To mark the new opening Tiffany also unveiled an immersive installation entitled ‘Fifth & 57th’ at the Old Selfridges Hotel, Orchard Street, London, open to the public from 3 July to 12 July. 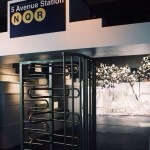 Recreating the brand’s magical Fifth Avenue world, visitors can enter the installation through the doors of a subway car and stroll a version of Fifth Avenue, ending up at a recreation of the flagship’s storefront. Posted on July 9, 2015, in #retail, #uk. Bookmark the permalink. Leave a comment.